Stores sometimes sell products similar in price to thrift store finds. 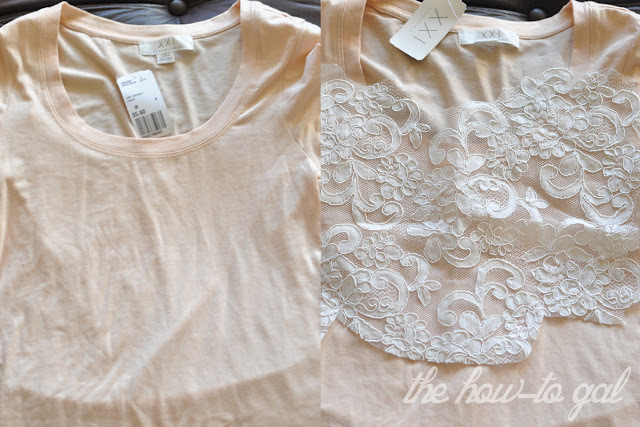 When is comes to a basic tee, Forever 21 is definitely my first stop. They have great variety and an awesome selection for cheap. I know the hoards of clothes and the bright neon leggings blinding you from the rack can be overwhelming, but just push through to the section you know you want and you'll be fine. The peachy pink color of this top is my all-time favorite color. Pair it with creme and you achieve perfection. Also, I think if you want to achieve a more professional look, it is all about the quality of the materials you use. 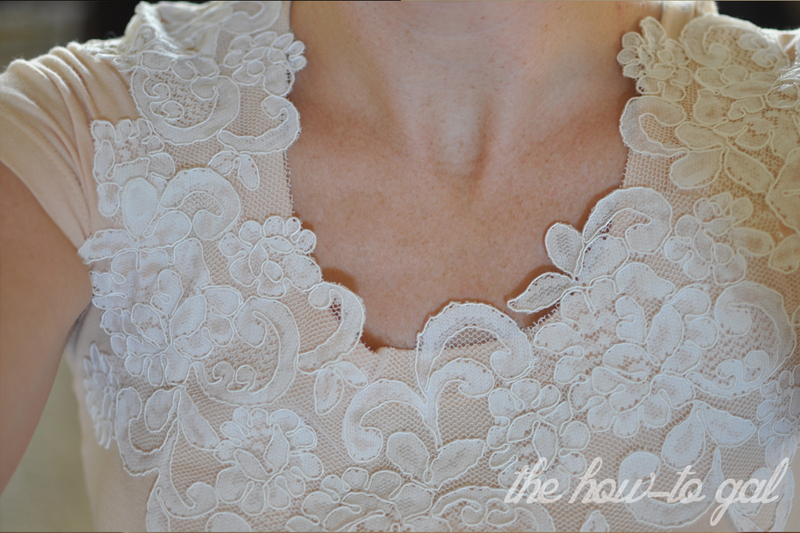 While the lace was some leftover pieces from my sister's wedding dress and was free for me, it originally was an expensive high-quality product. Because you are using such a small amount of fabric for a project like this, think outside of the box for your material and try to find remnant pieces that have been highly discounted, but aren't cheap products and you will be more happy with the end result. The great thing about lace is it is just repeating patterns. I cut and layered my pieces keeping in line with the pattern and you could never tell it wasn't all one piece I had just trimmed. Once the lace was in a layout I was happy with, I tacked it down with pins and used Liquid Stitch to adhere it to the shirt. Wow, that stuff is amazing! Imagine what a woman a hundred years ago would have given for this bottle of magic. As a side note, make sure you place a piece of paper or something similar underneath the front of your shirt for any excess glue that leaks through. 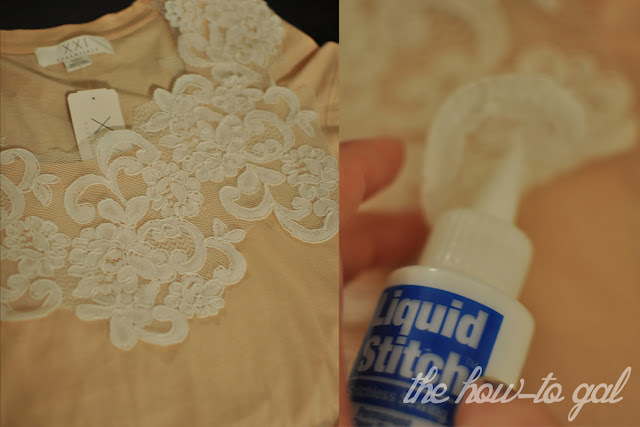 You don't want to be gluing your shirt together. With a little ingenuity and some crafting, I have turned this five-buck shirt into a much more expensive looking version. This shirt reads very Anthropologie to me. My husband thinks lace equals Granny. I definitely disagree with him on this one! I definitely don't equate lace with grandma! Looks beautiful Sandra. LOVE it.